Cell Reports has today published our paper describing a rapid phosphoproteomic time course of the activated gametocytes. The analysis sheds new light on how transmission stages of malaria parasites respond rapidly to xanthurenic acid, the compound that signals their arrival in the mosquito. 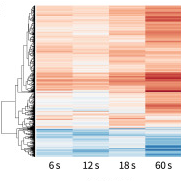 We have looked at hundreds of phosphorylation sites and how they change during the first minute after triggering the signalling cascade in the parasite. The work was led by Dr. Brandon Invergo, who holds an EBI-Sanger Postdoctoral (ESPOD) fellowship between the Beltrao, Billker and Choudhary labs, who contributed state-of-the art phosphoproteomics, and by Dr. Mathieu Brochet, who now runs his own lab in Geneva. A summary of the work can be found here.